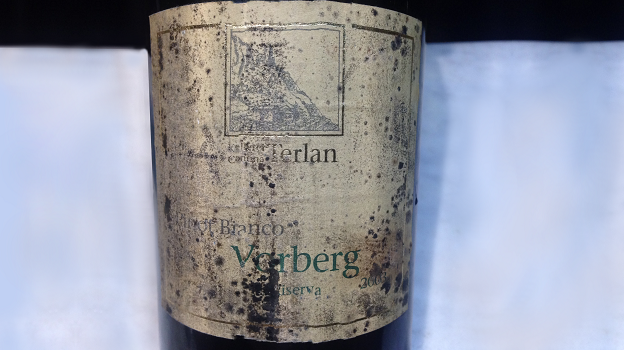 Though not much talked about, Italy’s Pinot Bianco wines can be outstanding, and Alto Adige’s Cantina Terlano’s Vorberg Riserva (Vorberg means “in front of the mountain”) is the best of them all. In fact, it is one of the country’s greatest white wines, with truly amazing ageing potential. First made in 1993, the grapes are grown in various vineyard parcels located at different altitudes (roughly between 600-950 meters above sea level) in between the San Pietro stream to the east and as far north as the town of Vilpiano. A wonderful wine normally, the 2003 is a jewel, especially in consideration of the furnace-like conditions of that sorry vintage. Golden yellow in color, it has penetrating aromas and flavors of yellow melon, tangerine, white peach and an intense minerality that speak clearly of the sandy-stony, schist-rich soils the vines are planted on. The acidity is harmonious and vibrant, nicely extending the rich, pure flavors on the long back end and giving this ripe, big wine plenty of life. 94/Drinking window: 2015-2025.